As you may have heard, things are starting to look a little different across many Google products—and today, Blogger is the next product to get a makeover. Throughout the design process, we conducted user interviews to help identify how to make Blogger even easier and more enjoyable to use. We also watched users try our new interface and made many refinements based on their feedback. Whether you’re on a dashboard or settings page of blogger.com, you can always create or edit posts with just one click at the top of the screen. Additionally, the post editor has been expanded and simplified to give you a larger canvas for drafting and previewing your work. 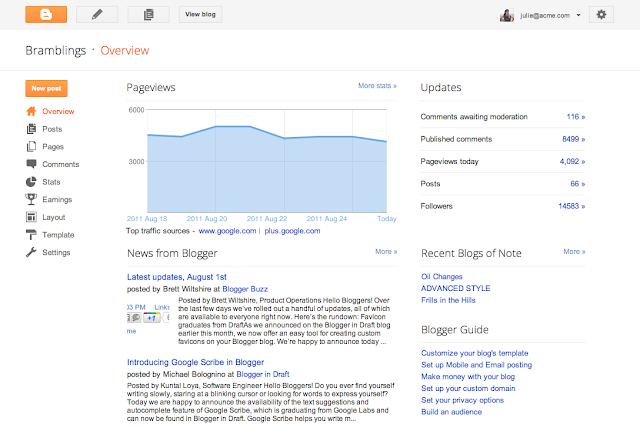 In the new “Overview” section of your dashboard, you’ll be able to quickly get a pulse for how people are reacting to your blog with a graph of your most recent traffic numbers, comment activity and follower counts. For extra guidance and inspiration, you’ll also find a list of helpful links, a feed of Blogger updates and a showcase of other blogs you may find interesting. Starting today, we’ll gradually let all bloggers choose to turn on the new UI, so your Blogger experience won’t be updated until you enable it. Over the next few days, keep an eye out for a pop-up announcement on your dashboard with instructions on how to get started, and check out this Blogger Help Center page to learn more about what’s changed. We’re working hard to fundamentally revamp and improve the Blogger experience from the ground up, and we hope you enjoy the first in a series of major updates that are on their way in the coming months. As we announced on the Blogger in Draft blog earlier this month, we now offer an easy tool for creating custom favicons on your Blogger blog. We’re happy to announce today that this feature is now available to all Blogger users. Adding to the featureset of our new mobile templates, you can now navigate through your mobile view with swipe navigation. This new navigation option lets you swipe through individual blog posts in a way that should feel very familiar for mobile and tablet users. If you are viewing this post from a mobile device, you can give this a try right now! A few weeks ago we announced the +1 button on Blogger, and now we’re happy to expand coverage to individual pages as well as blog posts. The +1 button will now appear on Pages as an option on the sharing widget just as it has appeared for individual blog posts. That’s it for now, more to come soon! Happy Blogging.